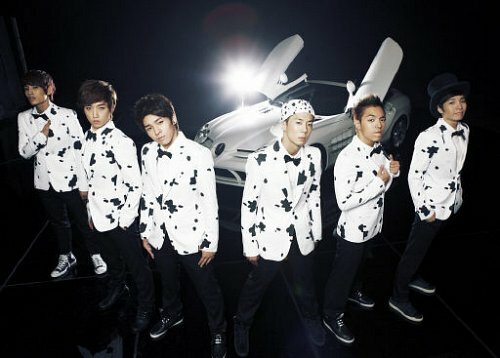 New boy band Dalmatian under MC Mong‘s management company Monkey Funch Entertainment made their debut on the Countdown. I’m not sure if it’s only me, but I was seriously confused over these boys’ look, their”concept” does not match at all with their song. They come out all hard, well as hard as you can be with a name like Dalmatian and actually wearing spots, and then start singing this cutesy song with barking in it. Actually, the first thing that came to mind when I saw them was of the joke of a rap duo named interestingly enough 101 Dalmatians, from the hip hop movie Brown Sugar which starred Sanaa Lathan and Taye Diggs. The group in the movie was a joke and in a way I hope this group was joking too because if they aren’t…aigoo. Check out Dalmatian’s “Round 1” for yourself. G.Na also made her comeback with the song “Super Solo.” G.Na definitely got the voice and people are loving her new styling, but the song is meh. I like how these music shows sometimes let lesser known non-idol groups have a share of the spotlight. I enjoyed this soulful performance by Goofy, a little variety is always good. Jo Sung Mo recently made his comeback after being sidelined by injuries he got while filming for Dream Team Season 2. The veteran singer has a great performance, but his song “I’m Gonna Cheat” leaves something to be desired. Wheesung also makes his comeback with the song “Real Slow is Back.” Wheesung has one of the smoothest voices in Kpop and I think he should have better songs to showcase it. F.T.Island hit the Countdown with their newest song “Love, Love, Love.” The song is not your standard Kpop and at first really gives an early Beatles feel. It’s growing on me. Taeyang won the Countdown with his song “I’ll Be There.” The song isn’t great (why , oh why autotune), but I like it better than “I Need A Girl.” Taeyang’s performances are alway sick with his tight choreo. Other performers of the night included: Rainbow, GP Basic, Secret, Super Nova, Nine Muses, INFINITE, and Eru. If you’re interested in checking out some of these these other performances try going here.